Agreement Signed - B&M Property Solutions, LLC. The next step in the B&M Purchasing Process after discussing options and determining your best path forward, is the legal documentation of our agreement. 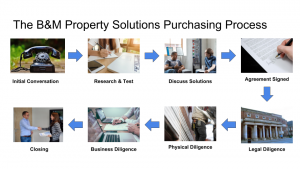 In the case where you choose to sell your property to B&M Property Solutions, we will document this with a simple Agreement For Sale. 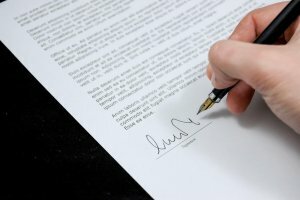 This two-page agreement effectively communicates your desire to sell your property and B&M’s desire to buy your property within certain terms and conditions. We can send you this agreement for sale via a variety of ways including via email, direct mail or most securely, through our electronic notary service. After you sign the Agreement For Sale, we proceed to the next step in the B&M Purchasing Process, Legal Due Diligence.